Image Credit: QA CHEW’S BUBBLE TROUBLE, Chewing Gum, 2018. Edition of 6000 by Hannah Jickling and Helen Reed with Karen Sandhu’s Grade 6/7 students at Queen Alexandra Elementary School: Aiden, Alex, Andrew, Angelo, Anna, Anthony, Celest, Edwin, Ellaine, Ellie, Farhin, Hannah, Jacky, Jaden, Jaymes, Jaykwon, Kaleb, Levi, Lily, Saiyaka, Susan, Tatiana, Tessa and Yoni. Photo by Terry-Dayne Beasley. The artists Hannah Jickling and Helen Reed will release their new Public Art project QA CHEW’S BUBBLE TROUBLE on October 31, 2018. As part of their ongoing residency at Queen Alexandra Elementary School known as Big Rock Candy Mountain, Jickling and Reed collaborated with grade six and seven students to design an original chewing gum. The gum was developed through a series of classroom workshops with the students and guest experts such as food scientist Kathrin Wallace that compared texture, natural and artificial flavours, and gum ingredients. The resulting gum is a uniquely abstract blend of both fruity and sweet notes, with some sharp and earthy tones. This gum as public artwork is the result of a year-long collaboration with students that explored the possibilities of shared research with kids who questioned their role as consumers. 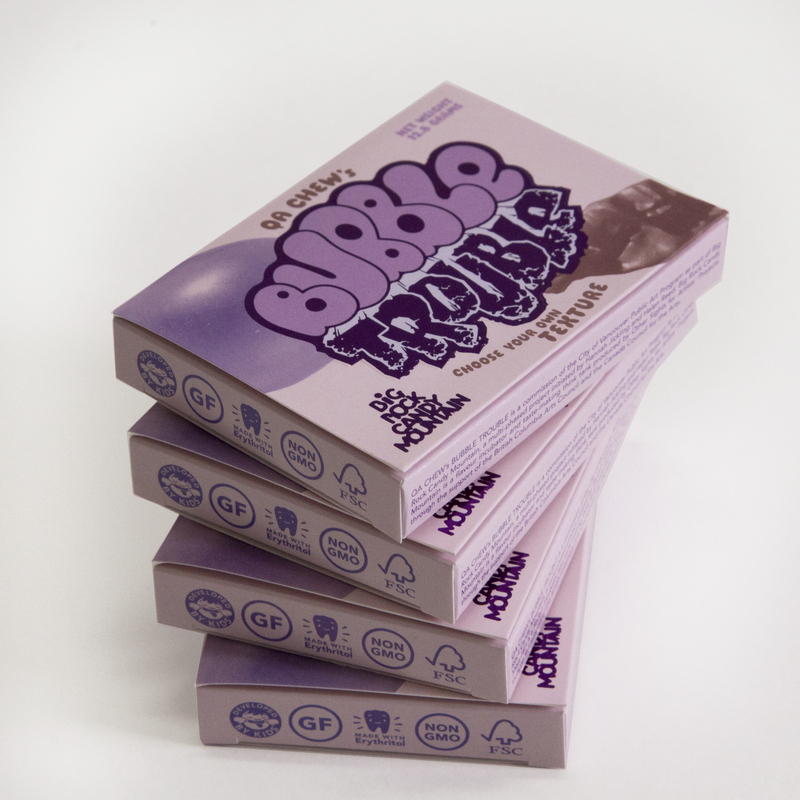 QA CHEW’S BUBBLE TROUBLE will be distributed to trick-or-treaters on Halloween night at select homes in the Mt. Pleasant, Commercial Drive and Hasting-Sunrise neighbourhoods. A limited amount will also be for sale on October 31st at the Western Front, 303 East 8th Avenue, from 5pm to 8pm as part of the opening of their exhibition Mouthfeel (November 1–December 15, 2018). Retail locations for the gum will be announced in the New Year, and all proceeds will go towards future art programming at Queen Alexandra Elementary School. Helen Reed and Hannah Jickling have been collaborating since 2006. Their projects take shape as public installations, social situations, and events that circulate as photographs, videos, printed matter, and artists’ multiples. They are currently fascinated with the synergies found in collaborative research, especially in their recent projects with children. Reed and Jickling have exhibited and performed internationally, with both individual and collaborative work, at The Portland Art Museum, The Dunlop Art Gallery, Smack Mellon, The Vancouver Art Gallery, and The Power Plant. In Fall 2017 they released Multiple Elementary, a book that explores the elementary school classroom as a site of invention and reception of contemporary art practices, published by YYZBOOKS. Reed and Jickling are recipients of the 2016 Ian Wallace Award for Teaching Excellence (Emily Carr University of Art & Design), the 2017 Mayor’s Arts Award for Emerging Public Art (City of Vancouver) and the 2018 VIVA Award (Jack and Doris Shadbolt Foundation for the Visual Arts). QA CHEW’S BUBBLE TROUBLE is commissioned by the City of Vancouver Public Art Program. Big Rock Candy Mountain is supported by Other Sights For Artists’ Projects, with additional support from the British Columbia Arts Council and the Vancouver School Board.